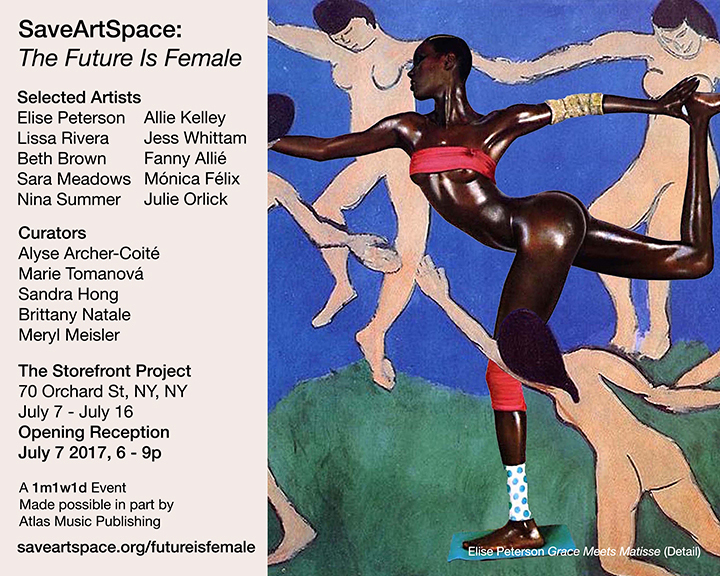 SaveArtSpace brings public art to New York City, showcasing local female artists on advertising spaces throughout the area beginning June 26, 2017. The exhibition is entitled ‘SaveArtSpace: The Future Is Female.’ As an arts organization, we feel that it is our duty to align and ally with the broader artistic community to create exhibitions that address intersectional concerns which can spread a message of progressive and positive social change and empowerment. The exhibition was curated by Alyse Archer-Coite, Marie Tomanova, Sandra Hong, Meryl Meisler, & Brittany Natale. There will be an opening reception on July 7, 2017, at 6pm.